Trail Trek Challenge is now a year-round hiking program for everyone. 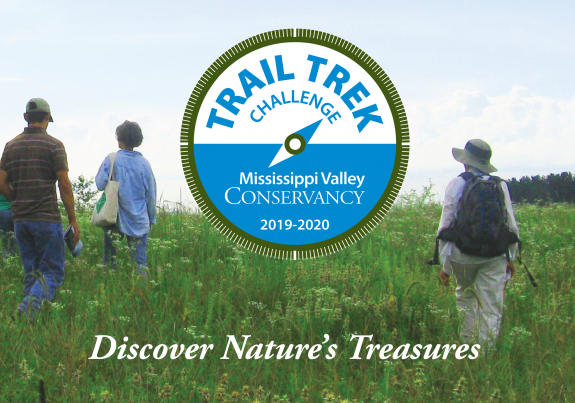 By popular demand, Trail Trek Challenge has been expanded to be a year-round hike/walk program on the nature preserves you've helped protect in five counties. Challenge yourself to hike at least five of the trails to discover nature's treasures and become eligible for some great drawing prizes! When you sign up, you will receive a confirmation message with a link to your downloadable Trail Guide & Hike Log with hike descriptions and a place to record the trails and qualifying events you've hiked throughout the year. Downloadable trail maps and driving directions to each hike location are available at the link under "Trail maps" below. By filling out and sending in your hike log with at least five hikes completed before April 20, 2020, you'll become eligible to win drawing prizes at next year’s Earth Fair 2020, where another year of hikes and walks will be kicked off. Trail maps for each of the Trail Trek Challenge hikes can be viewed and downloaded from the Nature Preserves section of this website. Please refer to your Trail Guide & Hike Log for the list of trails and qualifying events. All of the Conservancy's guided hikes also qualify as Trail Trek Challenge activities. You'll find them listed on the back of your Trail Guide & Hike Log. Details for each event can be found on our Events page. Watch this spot for a special hike feature each month throughout the year. Registration is FREE, and it all starts on Sunday, April 28, at Earth Fair 2019, in La Crosse's Myrick Park. We'll have a warm-up hike at 10:00 a.m. and a kick-off presentation about Trail Trek Challenge on the main stage at Earth Fair (Marshview Room in Myrick Park Center) at 11:00 a.m. Registration will open immediately following the presentation and will remain open until 5:00 p.m. The first 100 registrants will receive a special gift from Organic Valley! Online registration will be available on this page (below) beginning on Monday, April 29, 2019 and all year long! When you register online, you'll receive a confirmation message with a link to your downloadable Trail Guide & Hike Log with hike descriptions and a place to record the trails and qualifying events you've hiked throughout the year. Please contact our office with any questions by calling (608) 784-3606 ext. 8 or by sending an email to sarah@mississippivalleyconservancy.org. Organic Valley, Franciscan Sisters of Perpetual Adoration, WKBT/News Channel 8, Mid-West Family Broadcasting, Altra Federal Credit Union, Crawford County Community Fund, People’s Food Cooperative, Dairyland Power Cooperative, Kwik Trip, Trust Point, Inc., and Verve, a Credit Union.